Thunder Bay Fest 2018 was fantastic! Excellence, Integrity, Teamwork and Achievement. These 4 values were never better displayed than this weekend at the 5th Annual Thunder Bay Folk Festival. It takes a huge effort on the part of many, many volunteers to pull off a first class festival and there are so many people to thank. The board of the the TBFS meets every month year round to plan, organize, fundraise and promote the Folk Fest. Jeff Shea, VP is in charge of public relations and also was our community fire marshall this year. Larissa Chrzan is secretary and also helped out with volunteers and at front gate, and festival tear down. Lee Kitzman works on grant writing and is the barn stage manager and emcee, and is in charge of set-up and tear down. Peggy Schmidt is treasurer and in charge of front gate. Her daughter, Andrea Schmidt assisted at front gate, got the hay bales for the drum kiva, made festival decorations, and got us up and running on SnapChat. Paul Conger is the T-shirt committee chair, runs the drum kiva and gave a drumming workshop. Joan Prentice is in charge of membership, our mailing list, and runs hospitality for performers and staff. Jerry Broad is head of security, and works all weekend long in addition to lots of miscellaneous jobs pre-festival. Joel Choate Jr. runs sound on the porch stage and brings endless energy and enthusiasm to the weekend. Al Gross helps us in many ways, but is in charge of stringing the lights down to the drum kiva and storing them very carefully. Al & Sandy Dziesinski host our musical workshops every year. Diane Bartz is on the programming committee (which is a LOT of work), and painted our beautiful new signs, made the fishing pole ribbons, and other lovely creations for signage this year. She also programmed the workshops, obtained donations for the children's workshops and kept them on schedule all weekend. Diane also posted all the band bio's and workshop descriptions on facebook in the weeks prior to festival. Jim Bartz constructed the new signs and the hippie bus, came up with the plan for signs, made the new campground map, designed the sponsorship mailing, designed the festival program and helped out all weekend. Laura Frawley programmed and thought of adding our Stage in the Woods which had wonderful musical offerings and has been a great addition. She also wrote a successful grant for the Michigan Council of Arts and Cultural Affairs. Nicky Cornelius is our vendor coordinator and also does craft workshops. She and her husband Chad cooked us a delicious pancake breakfast Sunday morning. Her daughter Poppy Cornelius helps us decorate. Nicky is the artist who has painted our wonderful stage backdrops. Dennis Schmidt helped out at front gate all weekend. Skip Brown is on the programming committee and helps us get generators, does fundraising, and brings his tractor to the Tractor Grounds for the weekend which is a huge help. Rebecca Siegel organized the new Mind/Body tent this year, which was a wonderful addition and truly enjoyed by many attendees. Don Krajnik was the host for Friday performer hospitality, and organized food donations for Friday. Mark and Angie Addington worked long hours to run our merchandise tent and kept things very organized for our performer's merchandise sales. Amy Dodge researched and ordered merchandise, did fundraising, and arranged to bring the Optimist's Club Children's Tent. Linda Hudson was in charge of 50:50 ticket sales both days. Brayden Broad helped all weekend with security and generally checking on people. Mike Broad helped all weekend with security and safety. Chris Chrzan helped a ton on Sunday with hauling, cleaning, and did things that needed to be done on his own initiative. Carole Johnston is in charge of our website and our facebook page. The T-shirt design team was Rich Rider, Paul Conger, Larissa Chrzan and Curtis Merrill of Lines & Drips. Brilliant job! AND we have so many others to thank for volunteering, sponsoring, helping us spread the word and offering their support and encouragement. Thanks to all the musicians who volunteered their time and talents. You all keep us going and motivated to bring great music to our community. You guys are amazing! Thanks to GT Sounds for our Barn Stage sound. You blew the musicians away with your professionalism and the quality of the sound (and your kindness). 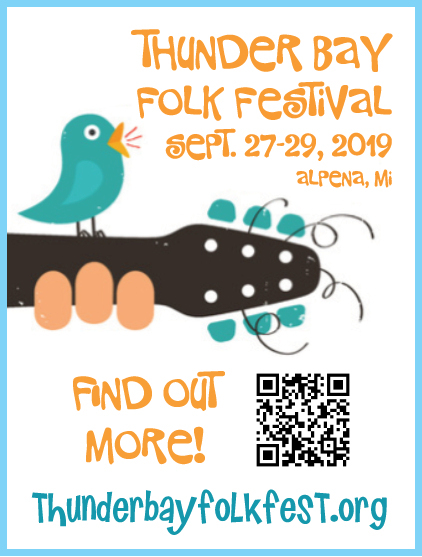 Thanks to North Central Security, Alpena Township EMS services, Jewell's Disposal, Gamble's of Alpena, Don's Ford Tractor, the Alpena Boys & Girls Club, and Joel's Guitar Shop. Thanks to all the local restaurants and food suppliers who donated food for our performer's. And of course thanks to all our volunteers, sponsors, vendors, and attendees. We hope everyone had a marvelous weekend and enjoyed themselves. We LOVE YOU all and are SO PROUD of the Excellence, Integrity, Teamwork and Achievement you accomplished this weekend. (I do apologize if I have missed someone, please know you are deeply appreciated).